Los Angeles was once known for our preponderance of programmatic buildings. The architectural style embodied by places like the Brown Derby shaped like a big hat, or an enormous hot dog that sold hot dogs, a drive-thru donut… In my September 2008 “Ask Chris” column I answered the questions: “What can you tell me about that barrel shaped building on Vineland Avenue in the Valley?” This sent me (and that big barrel) down a road that culminated with the building being purchased this weekend by the folks behind some of L.A’s most vibrant and unusual bars with genius plans to restore and reopen the landmark. 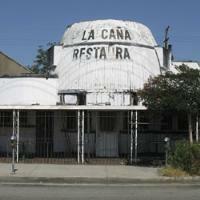 The decrepit restaurant, last run as a flamenco showcase called La Cana, has been closed since 1984. Former owner Dolores Fernandez was a tough interview, but I cajoled her into telling me her stories over lunch at a nearby coffee shop. No, the place wasn’t for sale (or haunted.) Yes, she has been living up there in the barrelhead with her menagerie of animals. After an injury, she closed the club temporarily and it never reopened. Soon after this initial meeting I saw the dim future for this building once Dolores was gone and during many long evenings and weekends, put on my citizen preservationist hat to write a City of Los Angeles Historic-Cultural Monument application for the property. The family of original owner Michael Connolly provided amazing historic photos like the one you see here and told me his story of arriving in Los Angeles as a railroad hobo and building his dream café and tap room in 1941 with his wife Irene. 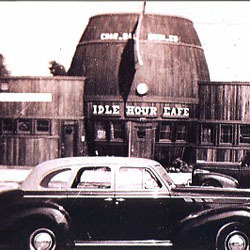 The application was approved and the Idle Hour Café became Monument #977 in 2010. When Dolores passed away, the county of Los Angeles acquired the property and put it up for auction. I told the story of the barrel to some folks that were experts at creating colorful and theatrical dining and drinking spots in the hope that they could breathe new life into this landmark. Bigfoot Lodge owner Bobby Green was captivated by the beauty of the barrel and signed on. After a year of working with Councilman Tom LaBonge, NoHo neighbors, the Museum of the San Fernando Valley and the Los Angeles Conservancy to ensure a bright future for this programmatic landmark it all came down to a mundane county auction. On Saturday morning there was a tense crowd with dozens of developers, builders and anxious neighbors hoping for the best. When the auctioneer shouted SOLD! It was Bobby Green and his 1933 Group that were victorious. Many high fives were slapped and we all gave huge thanks and congratulations to Bobby and his partners. Their plans for a full restoration of the place are amazing and wonderful and I’ll meet you all there for a drink when it reopens sometime next year as the Idle Hour Cafe. As a longtime preservationist, I can tell you that this is not the usual outcome for a story like this. I’m so happy this place is finally in good hands. Thanks, Bobby!